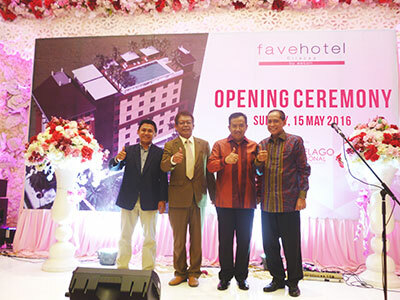 Cilacap, June 8th 2016 - Archipelago International, Indonesia’s largest hotel management chain, is continuing its expansion across Indonesia with the opening of the brand new favehotel Cilacap on May 15th, 2016. This latest addition to the favehotel portfolio is located in Cilacap, a small coastal regency in the southwestern part of Central Java. favehotel Cilacap sets itself apart from other budget hotels in the area by presenting top quality facilities typically unseen in the budget hotel sector. Namely, the hotel boasts a breathtaking rooftop bar with panoramic ocean views of Teluk Penyu, as well as a stunning ballroom that currently holds the title as the largest ballroom in Cilacap, capable of accommodating up to 800 guests. The hotel also features a swimming pool, mini market, free and super fast WiFi throughout the hotel, and comprehensive meeting rooms for any business needs. Boasting 108 comfortable rooms with top of the line twin and double beds, favehotel Cilacap also provides complete room amenities, including 32” LED TVs with international and local channels, individual ACs, en-suite bathrooms, writing desks with universal power outlets, in-room safety boxes and coffee and tea makers. Located in the center of Cilacap, the hotel is strategically built close to the railway station and airport. It provides easy access to Pantai Teluk Penyu, the Benteng Pendem historical site, and Alun-Alun Cilacap, whilst also being close to the region's industrial plants such as Pertamina, Holcim, and the geothermal power plant. Thanks to this diverse and convenient location, favehotel Cilacap is perfect for both leisure and business travelers alike. “We see the opportunity when we decide to manage a favehotel brand in Cilacap. It has both leisure and business market that compatible with all the facilities provided by the hotel. With a biggest ballroom in Cilacap and lot number of rooms, favehotel Cilacap targeted on MICE for all aspect of business such as conference, meeting and wedding. Beside online market that become another source business, we are confident that favehotel Cilacap will be a first choice for leisure and business travelers when visiting this prospering destination”, said Heru Purwono – Vice President of Finance Archipelago International.